BIG M MUSIC in Ellsworth and everyone at Ace's in Axtell! Here are some pics from Ellsworth. Pics from Axtell coming soon. Just wanted to make sure everyone knows we are coming to Axtell on Saturday September 29th. Right after we get done in Ellsworth we will hit the road and get to Axtell just in time to start pickin' and grinin'! Chase Foster will be my special guest. He is extremely talented and I am lucky to have him pick with me. This will be a show you don't want to miss. 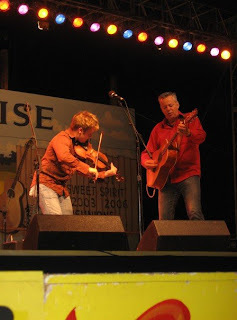 The picture you see is Chase playing with the worlds most incredible guitar player Tommy Emmanuel at the Walnut Valley Music Festival in Winfield Kansas just last week! Check out this little clip of Chase and Tommy. Here's a clip of Tommy playing Classical Gas. I want to let everyone know that I will be in Ellsworth KS in just a couple weeks. 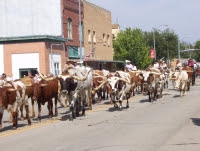 Saturday Sept. 29 Chase Foster and I will be making several appearances during the "The Great American Cattle Drive" festival. Ellsworth is doing a lot of great things and I am glad to be a part of it. Lookin' forward to the shows.